The Yowza Sanibel elliptical trainer combines the aerobic effect of an elliptical trainer with an intense abdominal workout; in effect 2 distinct exercises in one machine. The Yowza Sanibel has a 21” stride length, plenty long for any user and the foot pedals pivot for maximum comfort and minimum stress on the lower leg. The abdominal exercise is achieved though the counter-rotational handlebars which twist your torso, exercising all the abdominal muscles while you stride. Maximum user weight is a hefty 400 lbs. The display on the control panel is very large and backlit for easy viewing and comes with 12 pre-set programs. Heart rate is monitored through contact grips or by using a chest strap. Warranty is lifetime on the frame and braking system, 5 years on parts and electronics, and 2 years on in-home labor. 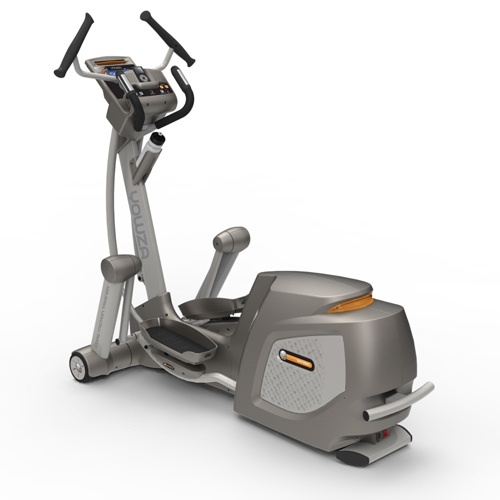 If you are looking to get the maximum effect out of your training time, the Yowza Sanibel will do that, as well as being a well built, quality elliptical trainer with lots of extras.